Another year. Another strategy. Another budget. Another long to-do list. Ushering in the new year is both an exciting and grueling time for content marketers everywhere. We’re celebrating accomplishments from the previous year. We’re taking stock of misses and opportunities. We’re working to weave in emerging content trends into next year’s plan. And we’re setting goals. But just like New Year’s resolutions, it can be hard to stick to the plan and tick off all of the things you want to accomplish. After all, the year is long and plans change often in today’s evolving digital landscape. To help you take on 2019 and muster up the motivation and inspiration to achieve your goals, we gathered several inspiring (and perhaps reassuring) quotes from respected and seasoned marketing leaders. From content strategy to execution, they’ll help you find success in the New Year. Find the Red Thread Oftentimes, marketers attempt to cast a wide net for their audience, hoping that more reach and more eyeballs can help them gain more traction. But in today’s content marketing landscape, personalization is essential if you want to reach (and hopefully fill your funnel) with the right people. And this bit of wisdom from Tamsen Webster serves as a great reminder that your brand doesn’t need to be everything to everyone. “Your brand is not for everyone. It isn’t. It’s for the people who want something you can help them get, who value the same things you do, and who see the world the same way you do. And that’s not everyone. Full stop.” [bctt tweet=”Your brand is not for everyone. It’s for the people who want something you can help them get, who value the same things you do, and who see the world the same way you do. @tamadear” username=”toprank”] Read our full conversation with Tamsen on how to drive change in marketing. Follow Tamsen on LinkedIn or Twitter. Monumental Shift Think your audience doesn’t have enough time for you? Andrew Davis urges you to reconsider. In the world of Netflix, Hulu, and YouTube, audiences are bingeing more content than ever before, he told attendees of Content Marketing World 2018. The challenge marketers face isn’t whether or not audiences have time to engage with you, but whether or not your content is worth engaging in. “Audiences will make time to consume content that contains their interest.” [bctt tweet=”Audiences will make time to consume content that contains their interest. @drewdavishere” username=”toprank”] Get more advice from Andrew with our recap of his #CMWorld 2018 session. Follow Andrew on LinkedIn or Twitter. Gartner At this stage in the game, storytelling and marketing have become married at the hip. But too often, stories come in second place to our larger marketing goals and objectives. 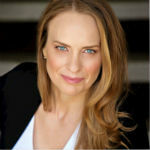 Heather Pemberton Levy challenges marketers to change that. If you truly want your message to resonate with your audience, the story needs to come first. “Many marketers still talk about their products and services in terms of what they can do for their audience rather than what the audience cares about, why that’s important, and how their solution can help solve the problem. Stories have the power to engage prospects with an emotional hook that endears them to a brand more successfully than standard marketing copy. [bctt tweet=”Stories have the power to engage prospects with an emotional hook that endears them to a brand more successfully than standard #marketing copy. @heathrpemberton” username=”toprank”] Read our full interview with Heather to learn more about her story-first marketing approach. Follow Heather on LinkedIn or Twitter. The Content Advisory More and more brands are pulling their content marketing in-house. But Robert Rose has a word of advice for brands internalizing their content marketing in 2019: don’t treat it as an internal agency. Content marketing needs to be a part of the larger business strategy, not a department that services other internal teams. “Content marketing (and content strategy) should be an active and discrete business model within the organization. Thus, the content team is more akin to your R&D team, your legal team, or your accounting team. “You would never look at the legal team as an internal agency (or firm) that services internal clientele. No. It’s part of the fabric and strategy of how the business operates. It is a strategic leader within the organization, and the legal team serves as experts to lead the business through legal issues. The content team should be viewed the same way.” [bctt tweet=”#ContentMarketing (and content strategy) should be an active and discrete business model within the organization. 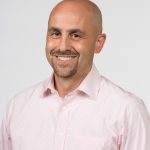 @Robert_Rose” username=”toprank”] Discover the rest of Robert’s top content trends for 2019. Follow Robert on LinkedIn or Twitter. MarketingProfs Content marketing is no longer a shiny object—it’s a core strategy and tactic for most B2B and B2C marketers alike. Content marketing is just “marketing” in the modern digital era. However, the majority of marketers feel like their efforts aren’t as effective as they could be. In order to grow sophistication and be more effective, you need to master the basics. For Ann Handley, this means we all need to slow down. “It’s important to slow down our marketing to get the basics right. Like developing a documented content strategy. Like doing the required research. Like developing robust, non-one-dimensional Flat Stanley buyer personas. Like articulating your bigger story. Like investing in quality: excellent writing (and editing) and storytelling.” [bctt tweet=”It’s important to slow down our #marketing to get the basics right. @annhandley” username=”toprank”] Find out what Ann says are her secrets to success. Follow Ann on LinkedIn or Twitter. The Economist When it comes to writing compelling content, marketers need to break the product-plug habit. Mina Seetharaman reminds marketers that your audience doesn’t care about your product, they only care about their problem. “Thought leadership is about solving, not selling. People wake up thinking about their problems, not your product. In our research, Thought Leadership Disrupted, only 28% of marketers cited helping their audience become more knowledgeable as a primary objective. True thought leaders don’t push product, they understand their audience and share ideas to help them tackle issues.” [bctt tweet=”True thought leaders don’t push product, they understand their audience and share ideas to help them tackle issues. @minaseeth” username=”toprank”] Follow Mina on LinkedIn or Twitter. Ridiculous Media Resonating with your target audience takes more than a carefully crafted message. It takes evoking emotion. Whether it’s a story or a joke, as long as it inspires an emotional reaction and avoids self-promotion, you’ll be forming more meaningful connections with your audience. According to Tim Washer, when done right, infusing a bit of comedy into your content can do just that. “These days, there’s so little content out there that truly connects with people. … So much of marketing is telling people how great we are. But with comedy—we can show them that we’re not always going to tell you how great we are. And if you can make someone laugh, that is the most intimate connection you can make.” [bctt tweet=”If you can make someone laugh, that is the most intimate connection you can make. @timwasher” username=”toprank”] Make more connections with your audience by reading the rest of Tim’s tips. Follow Tim on LinkedIn or Twitter. Adobe At every point in the customer journey, and even outside of it, your audience is leaving valuable data breadcrumbs in their wake. Looking ahead, Stacy Martinet hopes to inspire marketers to collect and analyze these breadcrumbs in order to better understand customers and boost productivity. “Data helps marketers work more productively, create the right content faster, and deliver that content to the right customer, across the right channels, at the right time. Companies that integrate data and creativity in their day-to-day practices actually drive two times the growth of companies that have those capabilities but manage them separately.” [bctt tweet=”Data helps marketers work more productively, create the right content faster, and deliver that content to the right customer, across the right channels, at the right time. @stacymartinet” username=”toprank”] Follow Stacy on LinkedIn or Twitter. TopRank Marketing In a world with increasing privacy and security concerns, our CEO Lee Odden, encourages brands to double down on trust, transparency, and credibility. The more you can align your brand values with that of your customers, the more trust and loyalty you will receive in return. “Building trust with customers is one of the biggest opportunities for marketers in 2019. Brands that lead with values and purpose can create opportunities to communicate transparently and with authenticity – leading to greater trust with buyers. Belief-driven buyers now make up the majority of consumers in every market. In 2019, we’ll see many more businesses articulating their brand purpose to more effectively connect with and engage customers.” [bctt tweet=”Brands that lead with values and purpose can create opportunities to communicate transparently and with authenticity – leading to greater trust with buyers. @leeodden” username=”toprank”] What else does 2019 have in store? Learn the rest of Lee’s digital marketing trends for 2019. Follow Lee on LinkedIn or Twitter. Persado From social media to comment cards to online reviews, your customers are not afraid to let you know what they think. If you want to optimize your business around the needs of your customers, Dan Gingiss challenges you to actively seek out, collect, and act upon that feedback. “Always be listening. People will generally tell you everything you need to know about your business—what’s working, what needs fixing, and what could be your next big hit. Marketers need to embrace the feedback, including compliments, questions, and complaints.” [bctt tweet=”Marketers need to embrace the feedback, including compliments, questions, and complaints. @dgingiss” username=”toprank”] To learn more of Dan’s marketing tips, read our full interview with him. Follow Dan on LinkedIn or Twitter. SAP No matter what you’re creating, Ursula Ringham has an important reminder: Don’t lose sight of the goal. Give your audience the next step. Nurture them through the customer journey. Otherwise, the marketing stories and best-answer content that you’re creating will do little in terms of helping you produce meaningful, measurable results. “You must have a call to action. What’s the point? What’s your end goal? How are you defining success? Where are you sending them? “Whether your goal is brand awareness or lead gen, if you’re telling a story that has people on the edge of their seat, you need to give them a natural next step to continue their journey.” [bctt tweet=”Whether your goal is brand awareness or lead gen, if you’re telling a story that has people on the edge of their seat, you need to give them a natural next step to continue their journey. @ursularingham” username=”toprank”] Get more of Ursula’s advice by reading our full conversation about her journey, influencer marketing, social media, and more. Follow Ursula on LinkedIn or Twitter. 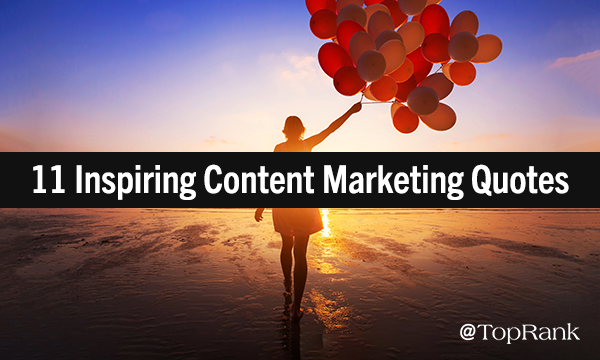 The post Take 2019 By Storm: Get Inspired By These 11 Content Marketing Quotes appeared first on Online Marketing Blog – TopRank®.